Harbor seals are particularly susceptible to the virus, which was found in most of the dead seals that were tested. An ongoing mass die-off of seals along the New England coast has been linked to an outbreak of a distemper virus. Almost 1,000 stranded seals have been reported along the coastline in Maine, New Hampshire and Massachusetts since July. As of last week, three-quarters of the seals were dead, according to figures from the National Oceanic and Atmospheric Administration. The remaining seals were reported as live strandings and were likely sick. The agency reported Friday that the main pathogen found in most of the dead seals tested was phocine distemper virus, a disease especially virulent among harbor seals, one of the most common marine mammals on the U.S. East Coast. Phocine distemper is similar to canine distemper and measles. It affects the respiratory, gastrointestinal and nervous systems of mammals, suppressing immune systems and leaving the animals vulnerable to other infections or disease. Distemper cannot be transferred to humans, but may affect pets, NOAA said. Some of the dead seals tested since the start of the die-off were infected with avian influenza, but further testing did not provide strong evidence it is the cause of the die-off, the agency added. “We are continuing additional testing to identify any other factors that may be involved in this event and will share those findings when available,” NOAA said in an online statement. While a viral infection may be the immediate cause of the die-off, some researchers believe decades of chemical pollution that jeopardizes the immune systems of marine mammals is an underlying cause. 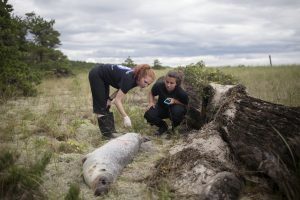 Kat King, left, and Katie Gilbert, interns from Marine Mammals of Maine, examine the body of a seal that washed up on Aug. 17 at Scarborough Beach State Park. Distemper virus is now suspected as the cause of hundreds of seals’ deaths along the New England coast. Reports of dead seals found on Maine beaches have come in at a relentless pace since July and show no signs of slowing down. “We’ve always had to deal with dead seals occasionally, this is the first year we’ve seen anything like this. It is insane,” said Jackie LaLiberte, the animal control office in Wells. 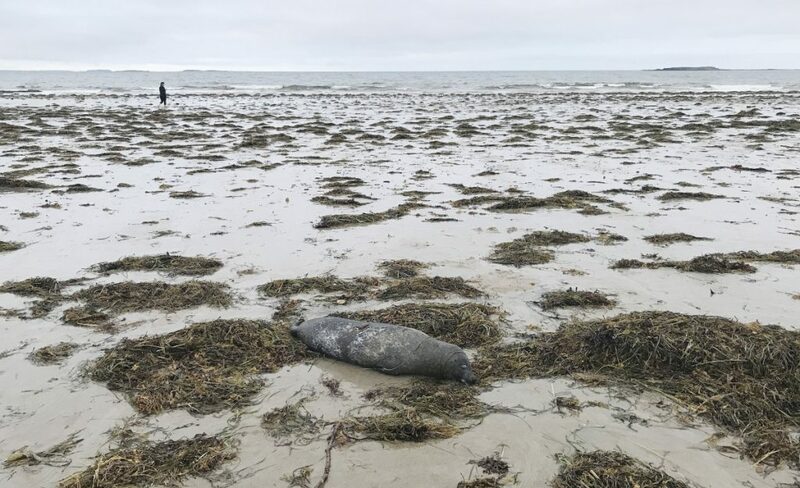 The police department regularly gets more than 10 calls a week from people who have found deceased seals while walking on the beach, LaLiberte said. She responded to six calls for stranded seals on Friday. Phocine distemper was discovered in seals during an outbreak off the coasts of northern Europe, the United Kingdom and Ireland in 1988. An estimated 20,000 harbor seals died during that event, nearly 60 percent of the population, according to research from the early 1990s. Distemper was linked to another die-off of least 30,000 seals in the Baltic, North and Wadden seas in 2002. The virus also was blamed for the most significant die-off on the East Coast in almost 30 years. In 2006 and 2007, at least 1,500 harbor and gray seals were stranded in an outbreak along the coast from Maine to Virginia. If the current trend holds, the number of seals deaths this year has the potential to come close to, or surpass, that event. Responders reported 999 stranded seals in New England between July and this week. Three quarters of the animals were found on southern Maine beaches, especially in communities south of Portland. Close to 500 seals were found stranded in New England in August, almost nine times the five-year monthly average. So far this month, 336 more seals have been found, NOAA said. In late August, the federal agency designated the die-off an unusual mortality event, authorizing a special investigation into its cause and possible reimbursement for rescue organizations such as Marine Mammals of Maine that respond to dead and stranded seals. Scientists aren’t sure why harbor seals seem susceptible to distemper, but believe that weak herd immunity makes episodic outbreaks worse. “There are always low levels of animals in the population that have the virus and pass it on but aren’t dying,” said Tracey Goldstein, a specialist in marine mammal disease at the University of California Davis. Her lab is testing samples taken from New England seals that have died in the last three months. Gray seals, on the other hand, appear to be more resilient to distemper. That means they can carry the virus without getting too sick or dying, but can also pass it on to harbor seals during the spring breeding season, when lots of animals from both species congregate on beaches. If a virus takes hold in harbor seals, it can spread rapidly, Goldstein said. “For whatever reason, they are really susceptible to the virus, when they are exposed they are really unable to fight off the infection,” she said. What effect this outbreak may have on the northeastern harbor seal population isn’t certain. There are approximately 76,000 seals in a population from the Bay of Fundy to New York, and the most recent federal stock assessment said the population was stable. Onshore seal strandings represent a small proportion of the animals affected, so it isn’t clear how many seals may have succumbed to the virus, Goldstein said. The massive European outbreaks of phocine distemper in 1988 and 2002 killed half of the population or more, but seals quickly rebounded, she added. “If the population is strong and remains strong, it shouldn’t have a long-term effect,” Goldstein said.